That’s Paul Goldberger’s New York Times review of our Pavilion for Japanese Art upon its unveiling in 1988—September 25, to be exact. Twenty years last week. 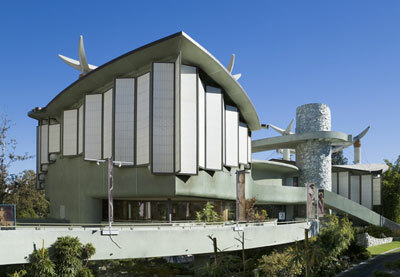 It is a somewhat bizarre building, so I took the occasion of its anniversary to ask Rob Singer, founding curator and department head of Japanese Art at LACMA, to share a few details. First, the roof, with those swooping, birdlike sculptural elements that look to be tied down by cables, as if they might fly away. Actually, the cables aren’t holding anything down—they’re holding the roof up, connected to the six massive columns rising through the building. “In traditional Japanese architecture,” Rob told me, “the walls are non-loadbearing.” In other words, if you were to peel the walls away like a banana, the roof would still be hanging over your head. The stones encrusting the two towers (one a stairwell, the other an elevator shaft) and other elements around the building are quartzite. This may be apocryphal, according to Rob, but the quartzite was discovered in a “lost” mine in Utah, which has since been re-lost. I am trying to decide where to hang a new American art acquisition—a portrait painted in 1832–33 by Henry Inman of Chippewa Chief No-Tin (which means “wind”). This is a particularly exciting process because this portrait is the first image of an identifiable American Indian to enter the collection. As soon as the painting returns from the objects conservation lab, where its frame is being repaired and cleaned, it can go up. However, underlying all these factors informing a curator’s decision is the fact that the historical object is always, inextricably removed from its original context once in the art museum. Are we trying to recreate that original context? Or rethink it? Trouble it? Draw attention to it? 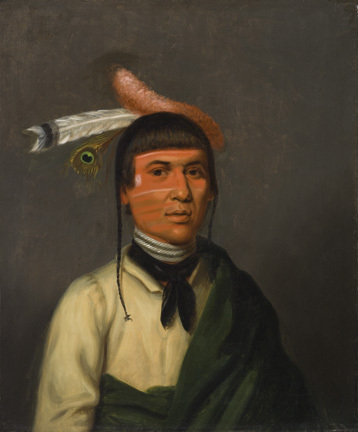 In the case of No-Tin, here is a portrait of a Chippewa chief who traveled with one of many Indian delegations to Washington, D.C., in the 1820s and 1830s as guests of the federal government. They sat for commissioned portraits destined for a national Indian Gallery. We could not recreate a portrait gallery of American Indians at LACMA, nor would we necessarily want to. What if I install the portrait of No-Tin prominently in our front gallery, with portraits of other eighteenth and nineteenth-century Americans, who were his previously unacknowledged contemporaries? I’ll be thinking through these questions in the next few weeks, so check back to see where I end up installing No-Tin’s portrait. Big changes are afoot at LACMA today, so we thought it would be a good time to introduce a small change as well. But first, a little prologue. 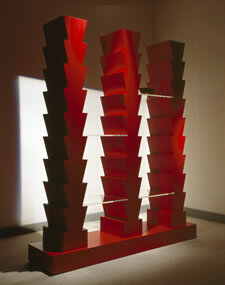 During the Ettore Sottsass show (spring 2006) I noticed that without much intervention the titles of the Italian designer’s works might arrange themselves into a found poem that we could call But Now, Ceramics of Darkness and feature on lacma.org. So I assembled the poem, added an introduction, showed the curator, and we concluded that, you know what, there was no home for it on the website. It wasn’t a show description, and it sure wasn’t art analysis; it was just a fan’s notes about something cool going on with the art. It was like what you might notice and remark upon to a friend in the galleries, and we just didn’t have a place for that. Well, as of today, we do. It’s called Unframed, you’re reading it, and it’s a blog begun by a number of us at LACMA who hope to transcend those major categories and create an open conversation about all the things we find intriguing or brilliant or curious as art fans and museum hands. In-house contributors will include a team of LACMA staffers and curators, and the subjects are bound only by a relationship, tangential or otherwise, to the art and artists of LACMA, L.A., and Southern California. I said “a conversation,” and that is key. To state the obvious, your involvement as readers and correspondents will help decide whether the blog succeeds and what it becomes. And the tone will be conversational, person-to-person. Passion, humor, and candor are prized. Being in touch with what turns you on about art is prized most of all. And we don’t deduct points for not having all the answers. As for the found poem of Ettore Sottsass titles… I can’t find it; the found poem is lost. You are currently browsing the Unframed The LACMA Blog blog archives for September, 2008.